Summer instantly puts everyone in a good mood. Warm sunshine, visits to the beach, longer days spent outdoors–what's not to love? Make your summer one to remember this year by crafting one of these DIY projects. From pool floaties to picnic blankets, you'll surely find something to make for the best summer ever! 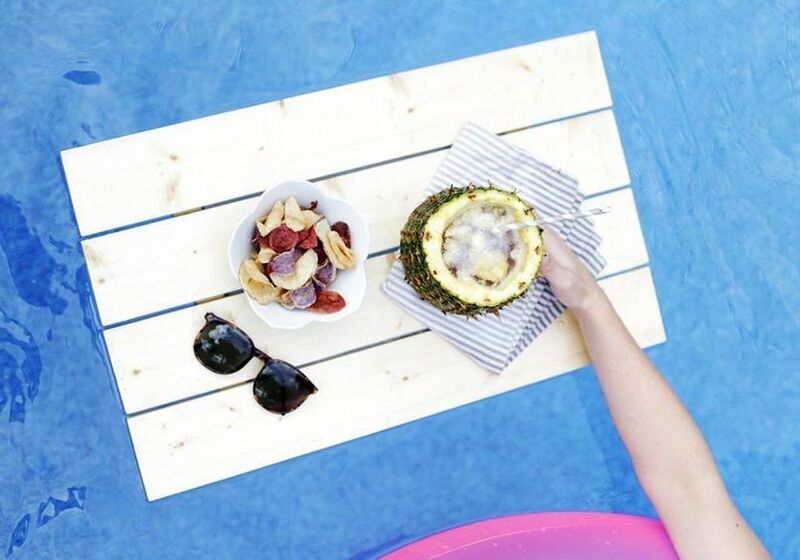 You can start with this floating pool tray. Nothing says summer like sipping tropical drinks with a cocktail umbrella on the patio or by the water. It is very easy to make your own summer cocktail umbrellas with this printable striped umbrella template which you can glue on plastic drink stirrers and place into your drink to make it look extra fancy. For an extra tropical look to your summer drinks consider using these DIY summer cocktail umbrellas in a tiki or coconut shell glass. While you are exploring a town on the coast as part of your weekend road trip or walking to a nearby beach keep all your summer travel essentials, such as sunscreen, sunglasses, snacks and whatever else you might need in this chic DIY foil vitamin sea tote bag. The reason why powder color races, where people run and have multi-colored powder thrown at them, are so popular is because the photos from these races are amazing. Not wanting to run a color race this summer? You can get the same look in photographs with this easy DIY to make various powder color that you can throw at your friends for a hilarious color fight that you can do outdoors and capture on Instagram. For your next backyard BBQ make a giant tropical drink pinata to decorate your patio and impress your guests. This amazing pinata will be a hit at your party as everyone can take a swing blindfolded to attempt to break the pinata open for the prizes inside. Help your kids stay entertained while they are at home over summer vacation by making an outdoor bowling game for them to play with by using pool noodles for the bumpers, a yoga mat for the lane, and some empty soda bottles for the bowling pins. Young children will adore this ice cream cart that you can build for them to play with which is better than many store bought toys. The ice cream stand, toy popsicles, ice cream cones and ice cream sandwiches in this amazing interactive toy set can be made using a Cricut with the provided templates and will provide hours of entertainment for children. Help protect yourself from the sun's rays and keep yourself cool by wearing this stylish gold scalloped beach hat that you can make by decorating a regular floppy beach hat. Not only is painting your own custom hat a fun activity but the beautiful design will look while lounging at the beach or pool. Hold several ice cream cones in this modern wood stand that you can DIY which is the perfect way to carry serval ice cream cones outdoors for your entire family to eat in your backyard. This ice cream cone stand would also to be a hit at backyard BBQ parties, where you can leave several stands of ice cream cones on a patio table for guests to grab for dessert. Give a fresh new look to your old cooler with paint and wood vinyl to craft a modern cooler tonight that perfect to use at picnics or weekends camping trips this summer. Spend this weekend playing a giant game of dominoes outdoors with the family by making your game set using pine boards that are stained and painted to create domino pieces. The completed game set is the perfect way to keep the family entertained while in the backyard or would be a hit at picnics in the park too. Awesome pool inflatables are super trendy this summer and chances are you have seen many popular celebrities posting pictures of themselves floating in the pool on their own amazing pool inflatable on Instagram or Snapchat. Instead of buying one of the expensive pool inflatables such as the unicorn, swan or donut you can make your own custom one instead by decorating an inexpensive pool raft or ring with sticker letters. Relax in the sun while laying down on this outstanding picnic blanket. This DIY is easy and no-sew! So grab a book, a drink and a basket full of goodies and head to the nearest park with your friends. Quickly find your beach towel when you are on the beach or pool by making your custom beach towel by using bleach on a brightly colored towel to stencil on your own custom phrase. When done your incredible new beach towel will be the perfect spot to lay in the sun while you dry off after swimming, and the unique design not only will help you find your towel but showcase your original style too. Decorate a room in your home with photos from all the exciting things you did throughout the summer such as backyard BBQs, festivals, and concerts by decorating the printed photographs with a decorative festival inspired fringe detailing. Adding fringe to your photos is a nice relaxing craft that is a great way to unwind on a summer evening after work. At the end of the summer, you can assemble all the fringe photos together in a short garland that is perfect to hang by your desk or living room and will remind you for the rest of the year all the fun experiences you had. Hosting a big family reunion or backyard party this summer? If so these handmade best summer ever drink koozies would make for the perfect party favor that you can give to all the guests so that they can keep their drinks cool all summer. This quick DIY project can be made by applying a vinyl sticker that you can make using a Silhouette onto a blank foam drink koozie.